Of course, these lists lack the intentionality of Latour’s. And arguably, and interestingly to me, the wordlists can be interpreted as the result of a computer performing on BIQ a “deformance” of the sort that Jerome McGann and Lisa Samuels invent and use on poetry in “Deformance and Interpretation.”[ii] McGann and Samuels model a process of criticism where the reader can reorder lines, isolate words, alter spacing, and add language as an alternative to close reading in order to disorient him/herself, particularly when encountering a familiar poem. Deformance therefore facilitates new readings, but does not suddenly reveal profound new meaning about the text. Rather deformance is a form of imaginative play, a performance that serves as a liberatory space for readers. The deformance in this case is not on a literary text, as McGann and Samuels would have it. It’s on a scholarly text. But isolating vocabulary in both has similar effects. My leap from poem to database is not a great one: here, we have isolating of anomalous terms, and at times, spatial altering that has taken place digitally (often resulting in a mistake of some kind). So I do not access new meaning about BIQ by thinking about deformance as I make my solitary way through the s-z word list (I am on page 8 of 79, or through 425/4,412 words; still in the midst of “se-,” much progress is left to be made). But there is insight, and play, made possible by reflecting on these word lists. For McGann and Samuels, deformative interpretations “[bring the reader] to a critical position in which we can imagine things about the text that we didn’t and perhaps couldn’t otherwise know.”[iii] Adam’s lists are an example of “isolating deformation,” since they “[eliminate] everything from a poem except certain words, to see what happens when they are alone on the page,” only on a larger scale and on both literary and scholarly texts. [iv] And therefore, as Adam notes, there is something to be learned by viewing the infrequent word choices or quotes selected by the contributors to BIQ. Recently I lingered in an extended “self” section. The majority needed a hyphen to form a compound word (selfalienation, selfcomplicating, selfdefeating, selfdeluding, selfdestruction). “Self-” is a common construction in BIQ, with 483 hits in the digitized journal articles. 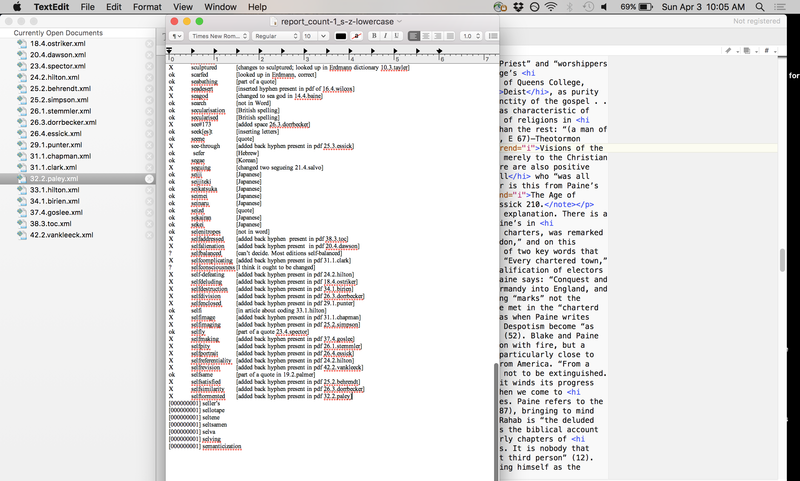 I corrected 21 erroneous “self”s, conflated into one word by a computer script in the digitizing process that deleted all hyphens at the end of words broken over two lines in the print version. As one of the least complicated of spelling fixes, my thoughts wandered to reflect on the irony of collapsing the self with various adjectives, participles, and nouns, and the visual starkness of committing the change to separate the “self”s again. I also considered the selves that my TextWrangler window brought together, those variety of researchers and their articles brought within a shared space on my desktop into a synchronous snapshot. Since the “self”s were isolated alphabetically, I could see that negative connotations dominated this sample of “self-” compounds, and speculated (inconclusively) why. And once I had made adjustments, I could search through BIQ for the other compounds they rejoined: “self-pity” in Joan K. Stemmler’s “ ‘Undisturbed above once in a Lustre,’” 21.1 1992, shares company with four other instances in the journal (David V. Erdman, “The Bravery of William Blake,” 10.1 1976; Philip Petrov, “Karl Kroeber, 1926-2009” 43.4 2010; and James F. Moyer, “ ‘The Daughters Weave their Work in loud cries’: Blake, Slavery, and Cotton 48.3, 2014-5), while “self-complicating” from David L. Clark (“Angela Esterhammer, Creating States” 31.1 1997) remains the sole example. A selection from today’s spellcheck litany was “sellotape, semanticization, semidried, seminally, sender, seniority, sensualists, sepialike, seraph, serpententwined, serrated.” Perhaps there is poetry, too, in unique fragments of scholarship. Perhaps there is something to find, in the isolation of the unknown and incorrect, and space for imaginative additions by readers (or at least one project assistant) of Blake/An Illustrated Quarterly. [i] Ian Bogost, Posthumanities, Volume 20: Alien Phenomenology, or What It’s Like to Be a Thing. University of Minnesota Press, 2012. 38. [ii] Jerome McGann, “Deformance and Interpretation” (with Lisa Samuels), in Radiant Textuality: Literary Studies after the World Wide Web. (New York: Palgrave, 2001), pp.105-130. [iii] Ibid., subheading IV, para 10. [iv] Ibid., subheading V, para 11. Pingback: Isolating Vocabulary in Blake/An Illustrated Quarterly | Uncategorized | Aggregated blogs on Romantic Studies - please click through to read full posts.